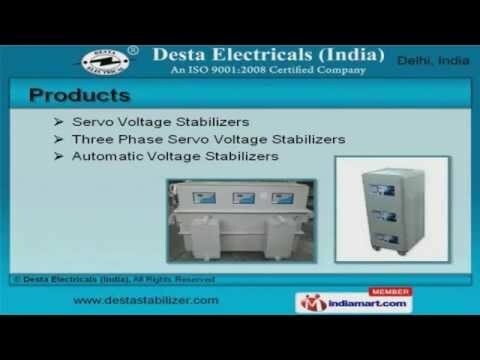 Welcome to Desta Electricals India, Manufacturer and Supplier of Electrical Power Conditioning Equipment. We are an ISO 9001:2008 certified company, established in the year 1986. Our Stateof-the-art infrastructure and Advanced RandD department make us different from others. Cutting edge technology, Large production capacity and Timely delivery schedules are the plus points of our organization. We offer a vast range of Servo and Automatic Voltage Stabilizers. Our Manual Voltage Stabilizers, Electric Inverters and Industrial Transformers are superior in performance. We offer Automatic Digital and Wall Mounted Voltage Stabilizer that are acknowledged for their functionality. Automatic Digital and Analog Meter Voltage Stabilizers offered by us are extremely reliable. Along with that we offer Voltage and Power Stabilizers that are available at industry leading prices. Our Servo Voltage Stabilizers for Scientific Laboratories and Automatic Voltage Regulators are a class apart.